It's time for the 214th Carnival of Nuclear Energy Bloggers and Authors. And, getting back to my usual form around here, it's unavoidable that I'm going to ask you to identify something ... or at least have a guess ready ... before I let you in. So, what is this? There could be a couple of right answers... or a range of right answers. Note that we're identifying the whole picture here and not a part of it. I will cover the range of answers at the end, so don't worry too much. NRC and the Non-Concurrence Process: Success or Failure? Dr. Marcus looks at the results of a survey conducted among NRC employees covering the NRC non-concurrence process. The results of the survey have been criticized by some high-profile people who see it as validation of their concerns about the NRC's safety focus. Dr. Marcus, however, looks at some other factors that may be affecting the survey results. Denmark, as its government proudly proclaims, is a nation of cyclists. But Steve Aplin, an Ontarian and proud publisher of 'Canadian Energy Issues,' points out that Denmark is also a country of CO2 profligates where electric power generation is concerned. The average Dane, riding around on his or her bicycle, scrupulously recycling his or her cans and bottles, and using much less electricity than the average Ontarian, had an electricity CO2 footprint nearly three times that of the average Ontarian. Aplin urges Danes, and Germans, to stop congratulating themselves and acknowledge they have been misled into supporting terrible energy policies. Only then will they have any real hope of reducing CO2. Musk knows that the only way to make a dent in carbon emissions in his lifetime is to supercharge the addition of new technologies like electric cars and solar. And, to give up a little bit of profit in favor of saving the planet. It could also make him another billion. Is Cuomo's fix against Indian Point already in? Andrew Cuomo has made no secret of his desire to close the Indian Point nuclear station as soon as possible. Though he has no authority to order the plant to shut down, he is doing everything in his power to develop alternate sources of electricity, and interest groups that want to use those sources instead of continuing to use the electricity from Indian Point. Michael Mariotte has been campaigning against nuclear energy for 30 years. He and his organization say they oppose fossil fuel and believe strongly that an all-renewable energy system is feasible if we simply had the will to implement it. Rod invited Mariotte to the Atomic Show to explain his ideas and rebut some practical challenges associated with his vision, which seems more like a mirage in Adams' viewpoint. The discussion was lively but cordial, and ended with the chance of future sessions. What's needed for a realistic and effective nuclear energy policy in the United States? How do we get there? A report from the 2014 American Nuclear Society Annual Meeting. The topic of safely transporting and storing used nuclear fuel at U.S. nuclear energy facilities is causing a lot of discussion in communities around the country. Questions about radiation shielding, safety and seismic capabilities are prompting the most responses, but there are also persistent misunderstandings about safely managing used nuclear fuel that muddy the conversation. By Mike McMahon, Senior Vice President, AREVA TN Americas. See the process for safely moving used nuclear fuel from a reactor into a dry shielded canister, transferring the canister to an independent spent fuel storage installation (ISFSI) and loading the canister into a fortress-like horizontal storage module. At the end of 2013, China's 17 operational nuclear power plants were producing about 2 percent of the country's total energy, according to Xinhua news. But Ye Qizhen, an expert in nuclear energy at the Chinese Academy of Engineering says that China should aim to get 10 percent of its energy from nuclear. China's President has also called for accelerated research in nuclear power. China has completed the basic technology research and published a development roadmap for a Generation IV demonstration supercritical water cooled reactor that could be commissioned in 2022. During the polar vortex in January, New England governors asked regulators to fast track the building of new gas pipelines and tranmission lines to serve the area. Governor Shumlin of Vermont signed this petition, but later, he reversed himself. In June, Shumlin said that we should go slow on transmission projects -- such projects become outdated as new energy technologies are developed. Shumlin's words were almost certainly a bargaining ploy. With Shumlin speaking against them, the project developers were warned that they would have to pay more (taxes, special funds) in order to do business in Vermont. The amount of property damage done by the earthquake / tsunami in Fukushima Prefecture is staggering, and is statistically much worse than in Iwate Prefecture. However, the Japanese press and government never report on the obvious. Tens of thousands of Fukushima "evacuees" would be homeless tsunami refugees if the nuclear accident had never happened, and the rate of "related" deaths in Fukushima Prefecture is almost exactly the same as in Iwate Prefecture. But, the news reports on the matter make it seem as if all Fukushima related deaths are because of the nuclear accident. This is a monumental coverup of the truth by the press and government. That's it for the entries this week. THANK YOU to all of the contributors for great material. Now, what was that? 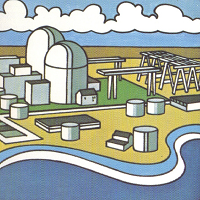 The illustration comes from the cover of a sales brochure covering ACF Nuclear Products - ERCO Division of ACF Incorporated's pool training reactor. So, if you said "pool training reactor" or "pool type reactor" or "training reactor," you win. 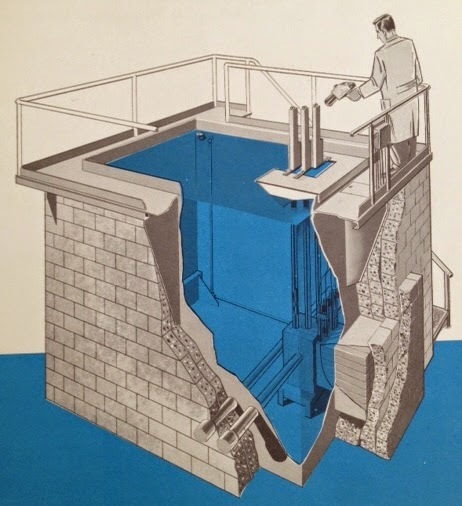 The reactor core is at the very lower right of the cutaway; the shielding blocks and tank have been cut away to reveal the large, non-pumped pool. The fuel elements offered were 3" by 3" MTR type, either 20% or 90% enriched. (Such elements were available "off the shelf" from Sylvania-Corning Nuclear at the time, at either enrichment.) Test locations included a through tube (4" diameter) and two beam tubes (also each 4" diameter.) A 2.5 foot square thermal area or "column" was provided beside the core for experiments requiring thermal neutrons. 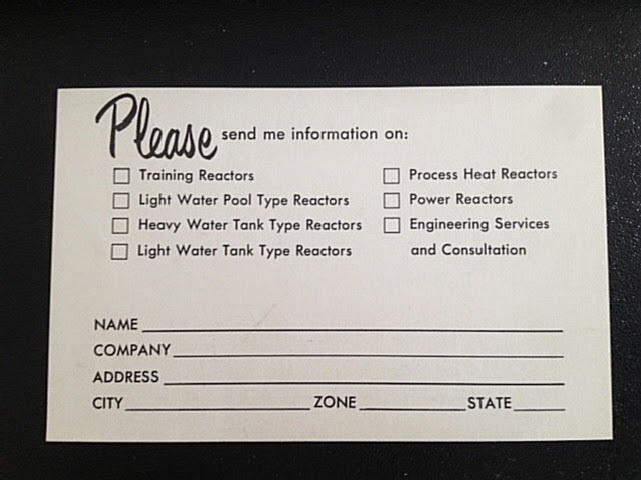 ACF Industries only had a nuclear power division for a short time in the mid-late 1950's. 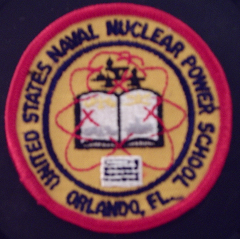 The company sold a number of training and test reactors, and offered more designs than it sold. A different sales brochure offers a standard ACF Heavy Water Tank Type (based on MIT and Italian reactors, see below), an ACF Light Water Tank Type, rated from 10 MWt to 30 MWt, and two power reactors - a boiling water reactor and a gas cooled reactor. Here are the ACF reactors of which I'm aware. Italy - Italian Nat'l Committee on Nuclear Research - 5 MWt heavy water tank type. 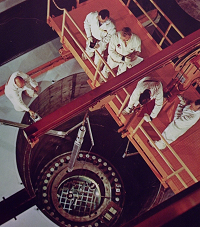 Said by ACF to be "the first sale of an atomic reactor abroad by a U.S. firm," the contract was awarded to ACF in February 1956 with the actual signing occurring later that year. USA - MIT Reactor (MITR) - designed by MIT staff, ACF principal contractor. Heavy water tank type, 2 MWt. Netherlands - Gov't Reactor Center, Petten - 20 MWt pool type. ACF selected for this project May, 1956. Sweden - Gov't Atomic Energy Commission, Studsvik - 30 MWt pool type. ACF selected for this project October, 1956. USA - US Air Force, Wright-Patterson Air Force Base, Dayton Ohio. NETR - "Nuclear Engineering Test Reactor," 10 MWt pool type reactor. 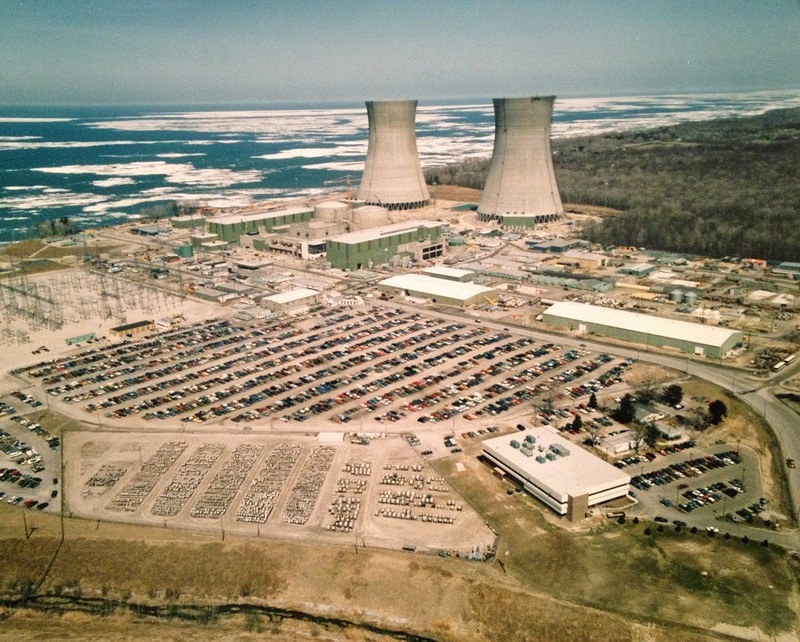 Elk River Reactor - ACF awarded this contract after the original reactor vendor, AMF, decided to shut down its nuclear business. 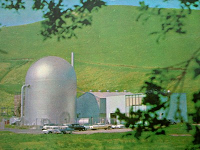 Note on above reactors: ACF Industries sold its nuclear power business to Allis-Chalmers Manufacturing Company in 1959, with the result that Allis-Chalmers completed most or all of the reactors above. It's certain that Allis-Chalmers was in charge prior to the completion of the NETR, the Netherlands reactor, Elk River. The illustration you saw at the top of this article is actually the 1 watt (thermal) pool type training reactor designed by ACF in 1958. This model was "portable, prefabricated" and sold for less than $150,000. ACF said that it was "the least expensive reactor of its kind being offered." It required only standard laboratory utilities, could be installed in existing buildings without excavation, required only a 40 ft. by 40 ft. floor area. ACF offered to supply the following services: Supervision of installation, training of operators, a service guarantee, laboratory manual, and assistance in preparation of (AEC) hazards report. •Minimum maintenance and operation costs." The brochure also says "ACF will prefabricate, deliver and install, at customers' site complete reactor including instrumentation and shielding. ACF will also supply operator training." Found in the original brochure whose cover was shown at top was a mailing card. The ACF nuclear division had some famous names associated with it during its short span of life from 1954 to 1959. For example, for a time its President was Dr. Marshall G. Holloway; Harold Etherington was for a time, its Vice President. 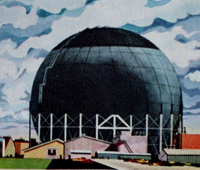 It had a good business on its hands when it was sold to Allis-Chalmers, who desperately wished to both expand its nuclear business generally and wished to get into power reactors specifically. Buying ACF's Nuclear Products Division got it both the Elk River power reactor project which was already underway, and a joint project for the Air Force with Kaiser Engineers on a gas cooled power reactor for Oak Ridge National Laboratory -- which ultimately was built but never operated, putting it roughly in the same group as the NETR at Dayton, Ohio. That's it for this week's Carnival. I hope you enjoyed the entries and the walk down memory lane! A reminder for APR readers; I have long maintained a stand-alone page on this blog which compiles links to comprehensive Fukushima Daiichi accident reports. Some of these detail the accident, while other detail the recovery from it; still others detail the responses in other nations to the accident, whether from a design / operation standpoint or a regulatory standpoint. I've added a couple of new links to that page today, and will note that a few others have gone in sporadically since the start of the year. Click here to see that page; it is always available by the link in the right sidebar. EPA Announcement; Where To From Here? ...and, just like that! We have, in the last 24 hours, at least in the minds of some, seen a complete reversal of fortune for nuclear power -- the dying former "nuclear renaissance" having been replaced by what is being breathlessly debated far and wide as a GHG emergency, whose ill effects the EPA will now quash by projecting emissions limits out a couple decades in the future and which can only be met by either nuclear power or some combination of renewables. Calls for nuclear power to make an exceedingly rapid return are all about us today. These go on and on. So what do we do from here? There are lots of ideas floating around, lots of camps claiming immediate victory, lots of camps claiming immediate economic collapse, and more. Let's take a breath here and make just a few quick, but calm, assessments that can give us a base for thought and further consideration. 1. Think about 1000 MWe-class (large) nuclear plants sooner rather than later. States will have "interim" goals to be met in the 2020's, and final goals (in total GHG emissions) to be met by 2030. If we think about it rationally, in order for new large commercial nuclear plants to help out in this time frame, they'll have to be ordered fairly soon. Not tomorrow, or next year, but soon. During the major days of nuclear plant construction in this country, nuclear plants were being generally scheduled so that from the date of contract award (vendor, architect-engineer, constructor) to the date of commercial operation of the plant on the grid was six years. Many were delayed far beyond this time frame. In many cases, preparations were made long before the actual plant contracts were awarded - planning, site selection, interaction with the community, discovery of financing all have to be completed before the actual nuclear plant is ordered. I'd expect that at least a few planned new nuclear generating stations that have been put off or had licensing work by NRC halted might get re-examined within the next six months to two years, after utilities figure out their options. Utilities will need to figure out how they're going to meet the emission goals and their projected demands; nuclear may just get injected back into the mix, but ONLY if the projected power demand makes it profitable. I do not expect a flood of new, yet unseen nuclear plant projects in the 1000 MWe+ class either; I do expect some reconsideration of shelved projects within a couple of years. Perry Nuclear Plant. Unit 1, nearer the lake, operates; Unit 2 incomplete. 2. Quick - complete the unfinished nuclear plants we cancelled years back! Nope. Not even close to a reality. Even though historically over 100 nuclear reactors were ordered and then cancelled, and some remain partly finished as curious post-apocalyptic-looking landmarks, there is no "ghost fleet" here to call into action. For starters, almost none of these sites has been extant in a vacuum, and population has likely changed around them - perhaps violating the original premises of plant siting near populated areas. Environmental considerations (flora, fauna, water) may well be a "no go" at many sites too now. This of course takes no consideration of the physical condition of unfinished (cancelled) nuclear plants .. some have been demolished in recent years (Marble Hill), some are left open to the elements and are essentially abandoned (every unfinished TVA plant except Bellefonte), and others were converted to something else (Midland, Zimmer.) Some of the unfinished plant sites never even had the required high-tension transmission lines built to them - and there would be a whole other zoning and building mess. If we look through the list of plants in any state of completion we rapidly find that precious few (such as Perry Unit 2, seen above) are completely contained or sealed, and maintained. None of these may be in an area that would call for capacity that high -- unless of course new transmission could take the power where it's needed. So although there might be a few specific plants this could work for, generally it's not a big resource. 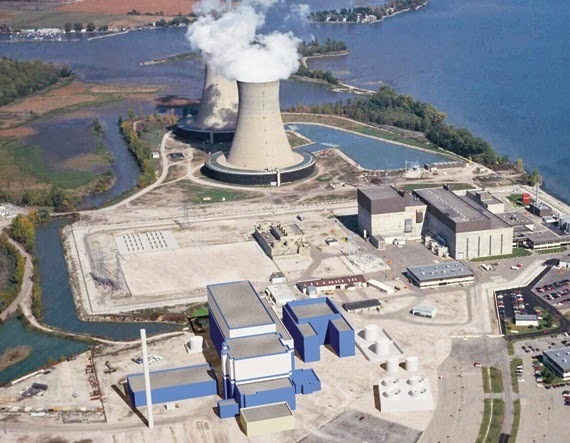 All that said, some few utilities (such as FirstEnergy) could well find themselves with nuclear plants completed less expensively than new-built nuclear plants. TVA certainly hopes so in the case of Bellefonte Units 1 and 2 .. and of course Watts Bar Unit 2 which it's now finishing. 3. Let's get SMR's into action rapidly to replace fossil plants. We might have to make a choice here, if we're to rush SMR's into the gap. We can either directly fund the designs under consideration now for DOE assistance through construction (in the mPower case) or licensing (in the NuScale case) and hope one of them can get completed soon enough, OR we can choose to further the path already becoming apparent and drop one design from DOE funding and throw everything behind the other, in order to guarantee that one of them gets built sooner. This is actually what happens when you "pick a winner," instead of what's happening now wherein we essentially temporarily designate two non-losers and hope their pockets are deep enough to skip along with DOE until a plant gets built somewhere, if someone wants one and will buy the power. Item: South Korea's SMART SMR is already licensed for construction in that country. It is not inconceivable that a DCA could be fast-tracked by KAERI to get the design licensed here. The question of who would build the plants remains, but in terms of completed designs this is the only complete and relatively powerful integral PWR SMR in the world. It should be a consideration in any realistic plan to "get SMR's now," by virtue simply of having been the first design certified commercial iPWR SMR anywhere in the world. 4. Now is the time to get moving on alternate technologies like high temperature gas cooled reactors, thorium fuel, and LFTR's! No... Not even close. "Not even closer" than my thoughts on cancelled nuclear plants. If we only have a short time to get moving on new non-GHG power generation, and if we surely have a limited supply of money, then now is precisely NOT the time to begin gambling on technologies that DIDN'T GET PICKED THE FIRST TIME AROUND for mass construction and deployment, and dilute funding going toward designs already underway. Has everyone noticed that during the massive nuclear buildout in the U.S. in the 1960's - 1980's that only two commercial gas cooled plants were built, and NO LFTR or liquid fueled plants? There are reasons for that, and they have nothing to do with weapons or politics. They have to do with economics, with reliability, with proven records of PWR and BWR plants, and with the complete lack of desire on the part of anyone to spend all the money required to develop a completely separate and new fuel cycle (thorium.) It would be a gigantic mistake ... if the peril really is serious ... to go off half-cocked in search of a unicorn when we have a perfectly good horse in the barn. FINIS. Well, ok, but does this move thorium up the ladder, you might say? Yes, but only "yes" if we see a big surge in nuclear plant construction using uranium fuel that drives the price of uranium up far enough that investing in thorium becomes attractive - attractive because it would be profitable. That would take a LOT of reactors, or a big surge in the number of announced reactors using U235. Could this trend open the door to fuel reprocessing? Maybe even a complete U fuel cycle with fast reactors? No, probably not, and that might never happen here no matter how bad it gets because we seem to either decide that the "worst thing ever" is storage of spent LWR fuel, or else at some other times the proliferation concerns of fast reactors. We really can't win on closing the fuel cycle if we can't even store spent LWR fuel without a daily fight. So don't get your hopes up on massive extensions of the benefits (to nuclear) of this EPA plan beyond having SOME new nuclear generating capacity derived from conventional light water reactors mixed between some 1000 MWe class plants for sure, and perhaps some SMR plants later. Not yet, anyway. That's it for now - I have many more observations about the EPA document, and concepts swirling around in its wake. I leave you with just these observations in the hope that they spur discussion and rational thought as pro-nuclear advocates prepare for what is sure to be a welcoming crowd of new enthusiasts. A LARGE crowd, I think. They deserve the truth. Give it to them, straight. 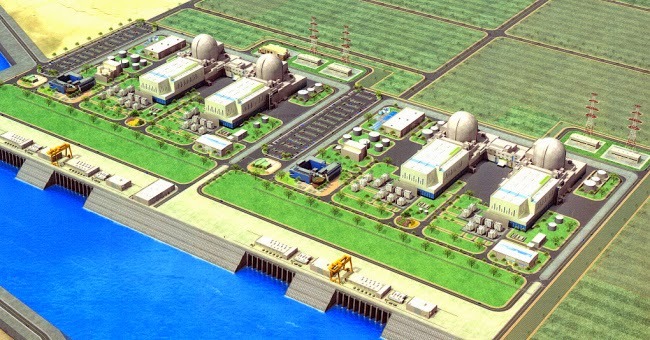 Could Korea, UAE partner in exporting nuclear plants? A very interesting development has taken place in the Republic of Korea's effort to export nuclear energy. 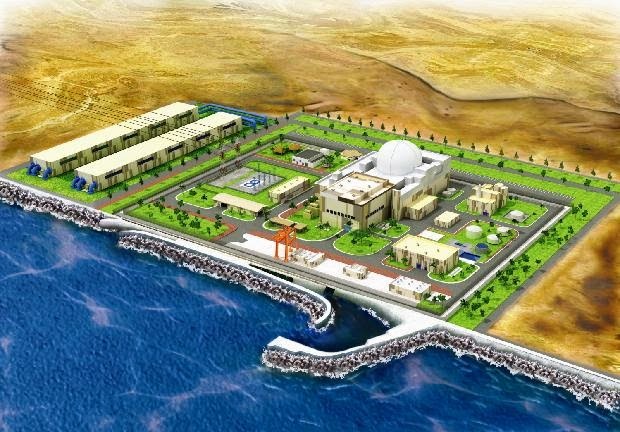 The ongoing project in the United Arab Emirates to build the Barakah NPP (four 1400 MWe units) has progressed conceptually to a consortium of Korea Electric Power Company (KEPCO) and Emirates Nuclear Energy Corporation (ENEC) working together to spread nuclear power through the Middle East and perhaps Africa. This may indeed be that final kick needed to open the flood gate of Korean nuclear exports; we shall see.